Toronto is finally thawing out from a days-long deep freeze, but snow and freezing rain made for a messy morning commute on Wednesday. Toronto is thawing out after days of extreme cold, but snow and freezing rain made for a messy morning commute on Wednesday. Snow fell during the overnight hours, and it turned into a combination of snow and rain as the temperature rose on Wednesday morning. As of 10 a.m., light rain and snow were falling and the temperature was a balmy 1 C.
About two centimetres of snow accumulated in the city, with higher amounts forecast for the western regions of southern Ontario near Lake Huron. But as rain mixed with snow fell in the morning, conditions on roads and sidewalks turned slushy. Good morning TO. Salters have been out on main roads since approx 3am in response to light snow. Salting will continue through the morning commute as required. 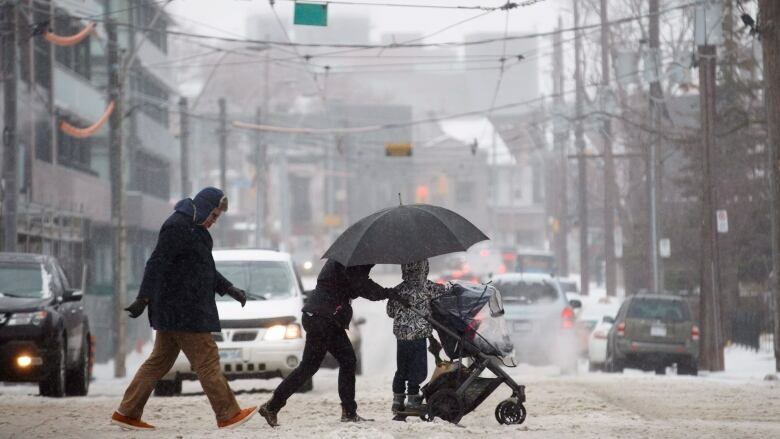 Environment Canada issued a special weather statement for the city and surrounding regions late Tuesday night, calling for snow, rain and freezing rain, as well as "strong, gusty winds" through the afternoon and evening. "A Colorado low will track northeast across Lake Huron and Georgian Bay today, bringing a dramatic change in weather with it," the statement said. In Mississauga, Alectra reported that thousands of homes in the Hurontario Street and Eglinton Avenue E. area were without power early Wednesday. The utility later tweeted that power had been restored. The snow and sleet is set to give way to strong winds and rain. The rain will persist into the evening before tapering off around 7 p.m., said Robert Kuhn, a severe weather meteorologist with Environment Canada. Toronto could see a high of 6 C by mid-afternoon, he added. The Colorado low system coming north from the U.S. is driving the sudden rise in temperatures. The unseasonably warm air will not stick around for long, though. "The January thaw is not going to last very long. It's a one-day wonder," Kuhn said. "Colder air returns tonight with temperatures dropping back to zero by Thursday morning." While it's too early to say for certain, Kuhn said its likely that southern Ontario could see another dumping of snow on Monday next week.